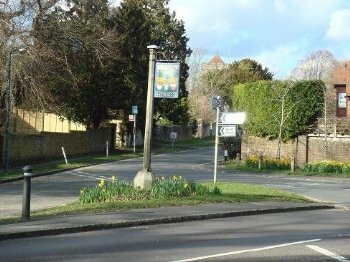 Ringmer Parish Council was formed in 1895. William Langham Christie of Glyndebourne, the lord of the Manor of Ringmer, was the first Chairman and Charles Washer the first Parish Clerk. Ringmer now has 13 councillors, with elections called every 4 years. Ringmer is a village and civil parish in the Lewes District of East Sussex, England. Ringmer Village is located 3 miles (4.8Km) north – east of Lewes. There is a second settlement in ringmer at Broyleside and the remains of much older settlements than Ringmer Village at Wellingham, Gote , Middleham, Ashton and Norlington. Ringmer is a large village with about 4,800 inhabitants. About 60% of the residents live in Ringmer Villabge, 20% in Broyleside and the remainder in the more rural parts of the parish. There has been human habitation since at least Roman times. Recently a large Roman settlement has been discovered near Barcombe Mills and a probable Roman Villa has been identified elsewhere in the parish. The village church, dedicated to St Mary the Virgin, was probably built in the 13th century. Modern Ringmer still remembers two of its famous families in the street names of Springett Avenue and Harvard Road. Gulielma Springett, the posthumous daughter of Sir William Springett whose relatives lived at Broyle Place married William Penn, the Quaker founder of Pennsylvania in 1672. A certain John Harvard visited his university friend, John Sadler, son of the vicar of Ringmer and fell in love with his sister Ann. They were married in South Malling church in 1636 and left for America with a vast collection of John Harvard’s books. John Harvard died but his widow and others set up a college known today as Harvard University, endowing the library there with his books. The symbol of Ringmer is a tortoise named Timothy, after the female tortoise that the naturalist Gilbert White carried back to Selborne in Hampshire in 1780.White’s aunt Rebecca Snooke lived in Delves House in Ringmer where Timothy had the run of the courtyard garden for over 40 years. Timothy died in 1794, a year after Gilbert White, and her carapace is on display in the Natural History Museum. Ringmer has two schools, Ringmer Primary School for ages 4–11 and Kings Academy, Ringmer for students aged 11–16. The Academy houses the local swimming pool, built by the community, which is run by Wave Leisure. The Village Hall located opposite the Green is managed by the Village Hall Committee and is the centre of village activities. There are 9,000 parish and town councils in England. Over 16 million people live in communities served by these local councils, which is around 25% of the population, and about 80,000 councillors serve on these councils. It is calculated £1 billion is invested in these communities every year. Their activities fall into three main categories: representing the local community, delivering services to meet local needs, and improving quality of life and community well being. Local councils can provide and maintain a variety of local services including allotments, bridleways, burial grounds, bus shelters, car parks, commons and open spaces, community transport schemes, community safety and crime reduction measures, events and festivals, footpaths, leisure and sports facilities, litter bins, public toilets, planning, street cleaning and lighting, tourism activities, traffic calming measures, village greens and youth projects. These existing powers were recently strengthened by powers contained in the Localism Act including the extension of the "General Power of Competence" to eligible local councils.Not every civil parish has a parish council: smaller ones—typically those with an electorate of fewer than 200—have parish meetings instead. A parish with a small number of electors may share a council with one or more neighbouring parishes; such an arrangement is known as a grouped parish council, or sometimes as a joint parish council, common parish council or combined parish council. Parish councils are funded by levying a "precept" collected with the council tax paid by the residents of the parish. Parish councils have unpaid councillors who are elected to serve for four years, unless a casual vacancy arises which may be filled by a by-election or by co-option. Parish councils have the power to tax their residents to support their operations and to carry out local projects. Although there is no limit to the amount that can be raised, the money can only be raised for a limited number of purposes, defined in the 1894 Act and subsequent legislation. The "General Power of Competence" is a power awarded in 2012 to eligible councils. The exercise of powers is at the discretion of the council, but they are legally obliged to exercise duties. Parish Councillors are elected by the electors of the parish, under section 16 (2) of the Local Government Act 1972, every four years. A councillor may also be returned by bye-election, co-option, and appointment by the district council or by return after a successful election petition. All Councillors are required to complete a declaration of Acceptance of Office and to provide a written undertaking that they accept the Council’s Code of Conduct. The Clerk also acts as an Executive Officer and uses statutory executive powers to take any appropriate executive action required for routine council administration that requires no policy decision. This power includes all urgent safety work. The Clerk may seek information; draw up proposals, or present ideas or suggestions to the Parish Council or its Committees, Working Parties or the Chair. As the official administrator the Clerk performs all routine administration without specific instructions from the Parish Council. This includes statutory duties such as service and issue of statutory notifications, attending meetings, and acting as a representative of the Parish Council. The Clerk will arrange insurance, keep and file records, record interests and standing orders, prepare and distribute agendas, prepare minutes and press reports, examine reports and other data, present information, deal with all routine correspondence, and perform all other office work. The Clerk also takes on the administration of finance, working with auditors and providing annual accounts, and other routine financial matters without specific instructions from the Parish Council, to include preparing budgets and accounts, orders, receipts, invoices, cheques, VAT returns, and audit returns. The Clerk will monitor and balance accounts, present reports, make purchases and complete all other routine financial functions. Many matters are delegated to the Clerk, who can make decisions on them working within established Council policies and lines of authority. The day-to-day management of services is the responsibility of the Clerk. Both Councillors and the Clerk must work within the law. Within the framework of policies decided by Councillors, either at full Council or Committees level, the Clerk, often in consultation with the Chair, will take many decisions every working day. The Clerk is also the Responsible Finance Officer who is ably assisted by the Assistant Clerk. Under section 151 of the Local Government Act 1972 an RFO has to be appointed. This is a legal requirement for all Town and Parish Council’s. An RFO is usually responsible for managing all aspects of the Councils finances including requesting the precept which is a Council’s main source of income. The Finance Officer also advises the Council and ensures that the Council functions under the requirements of its Financial Regulations and Section 151 of the Local Government Act.